Join us as we explore this delectable treat! The French Macaron is a highly sought after, delectable treat. 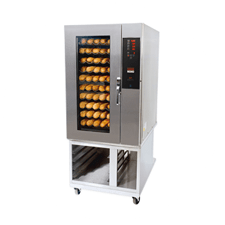 Join us as our host Dan DaRocha and Austin Archdeacon, an experienced baker and Sales Consultant at Erika Record Baking Equipment discuss how to produce these tasty little treats! Create simple syrup that will be used for the meringue. Heat both the water and granulated sugar to a temperature of 240°F (115.5°C). Avoid disturbing the mixture. Mixing can result in crystallization. Sift both the almond flour and confectionery sugar into a large mixing bowl. Add the second batch of egg whites with your dry ingredients and proceed to mix using a Planetary Mixer (paddle attachment). Whip the first batch of egg whites, once they begin to develop a peak, add the the simple syrup. Continue mixing until bowl feels like it has cooled down to the touch. Fold the meringue mixture into the almond flour mixture. Deposit batter onto cookie sheets. Let deposited batter rest on the cookie sheet for approximately 20 minutes or until a shell forms on the deposits. Bake at 293°F (145°C) for 4 minutes and then lower temperature to 266°F (130°C) for another 5 minutes. Cool French Macarons to room temperature and proceed to create sandwiches with the filling of your choice. Enjoy your freshly baked French Macarons! 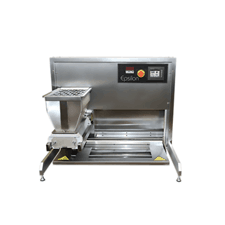 The Epsilon Tabletop Depositor is perfect for bakeries with confined spaces. 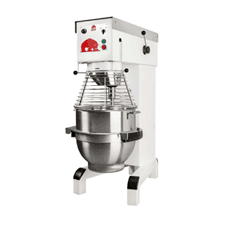 Versatile and compact, this machine is suitable for a wide variety of products. Click here to learn more.